Considered by many to be the queen stage of the 2014 USA Pro Challenge, the peloton raced twice over Monarch Pass today. The second time they reached the top of the mountain, they got to stop. Monarch Mountain was a constant scene of activity during Stage 3. Today was a big sky Colorado kind of day with our typical blue skies and white clouds forming the background for Mic Rogers' solo breakaway for miles and miles. This was the third day for the main GC contenders to spend some quality time together out on the road. I was happy to see everyone had thawed out from Stage 2 and Fränk Schleck was back on his bike after his crash yesterday. No screaming at officials today, just your typical audible cussing on TV coverage from the race leaders. (Nice for the kids watching). With 6.3km to go in the stage (of 155km total), the yellow jersey group were climbing together to the final mountain top finish on Monarch Mountain. A series of attacks began by first Jaramillo and Acevedo, then pressure by Tom Danielson, and another attack by Bruno Pires. Matthew Busche made a big attempt with 3km to go. 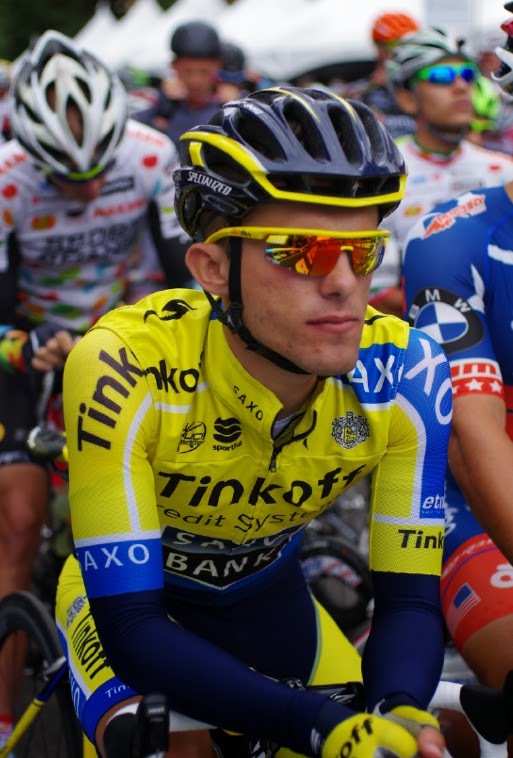 But after he was brought back, Tejay made the decisive move with only Rafal Majka catching his wheel. Within three minutes it was clear that Tejay would take the stage and the leaders jersey. A decisive stage today with big changes to the GC. I didn't get to go to the stage today (but I love that Tour Tracker!). I was happy to return home to Denver to take my dog back to his vet in Boulder to see Dr. Kaye to have his stitches removed from his cancer surgery last week. Jack had traveled with me to Aspen this week and had a great time, especially at the festival area and at the Hotel Jerome where free dog treats flowed. I look forward to being back at the race tomorrow where I plan on riding my bike into Garden of the Gods to be with the fans. See you out there! 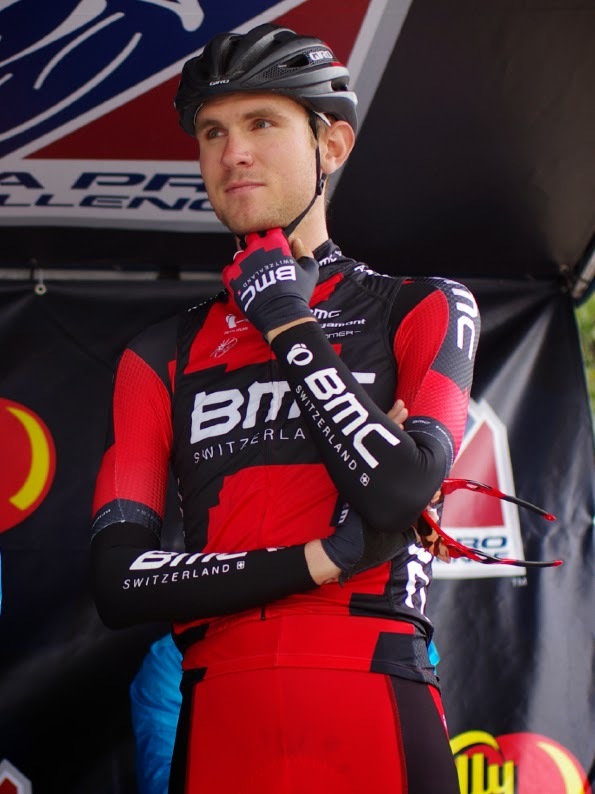 Born in the state of Washington, but raised in Montana, Tejay now resides with his family in Aspen, Colorado. 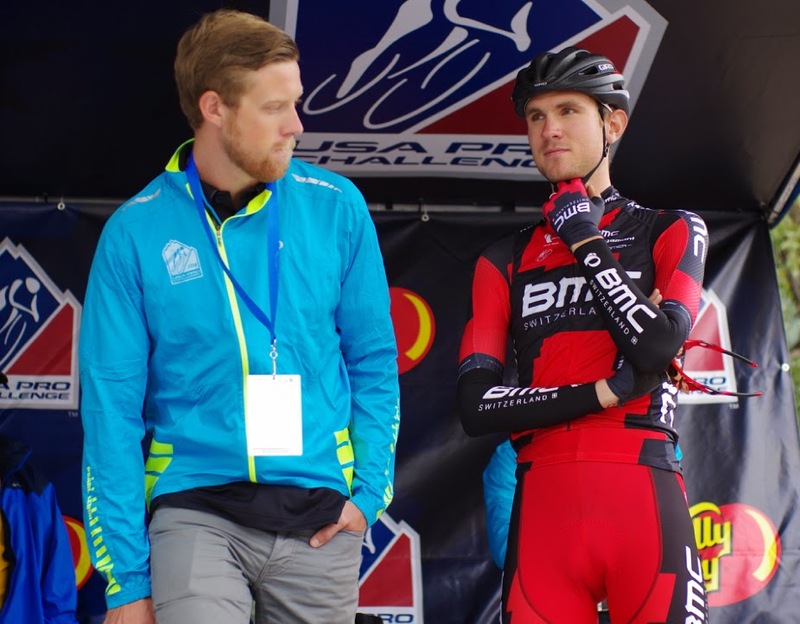 By age ten, Tejay was a bike racing phenom, he won numerous junior national titles and is a product of Colorado Junior development teams. Mostly he has the right genes combined with excellent mental tenacity and professionalism. He became a pro in 2008 first with Rabobank (he is of Dutch descent and speaks the language) then HTC-Columbia, and finally BMC. This standout climber from Poland is only 5'8" and 137lbs. He has been with his current team (under 3 different team names) since 2011 when he went pro. He won two stages of the Tour de France in 2014 and the coveted polka-dot mountains jersey. Rafal lists the Vuelta a España as one of his favorites races, he is missing out on that race to be here in Colorado. He currently sits 2nd in GC and 4th on KOM classifications. I hope it has been worth his time. 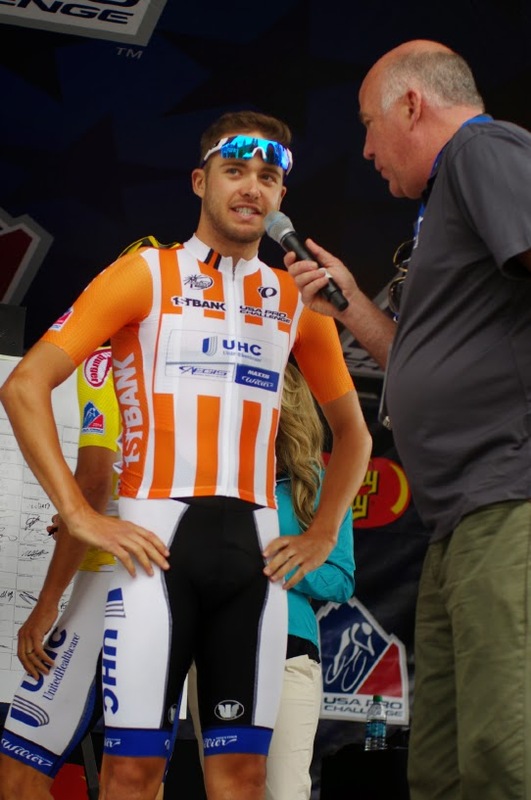 I haven't mentioned them yet, but people are already searching my website for Podium Girls for this year's race and instead landing upon my Podium Girls 2012 USA Pro Challenge or The fans want Podium Girls? links. 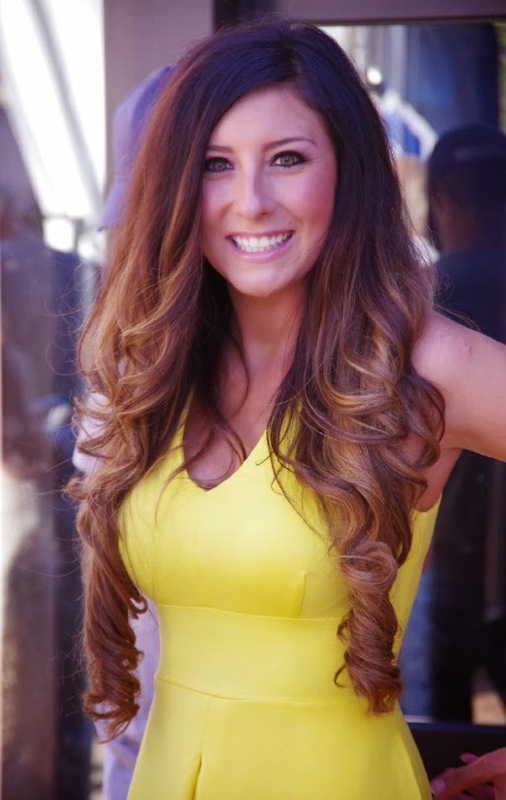 So here are a few photos of Courtney James and Heidi Golznig, the 2014 USA Pro Challenge Podium Girls (their official name is Pearl Izumi Podium Hostesses). Courtney and Heidi travel from stage to stage during the USA Pro Challenge with Race Announcers (those two guys on stage) Brad Sohner (@brahsohner) and Dave Towle (@DaveDTowle), two of the nicest guys you will ever meet. They know a lot about each rider and really understand race tactics, they also have the ability to talk - for hours about anything bike race related. 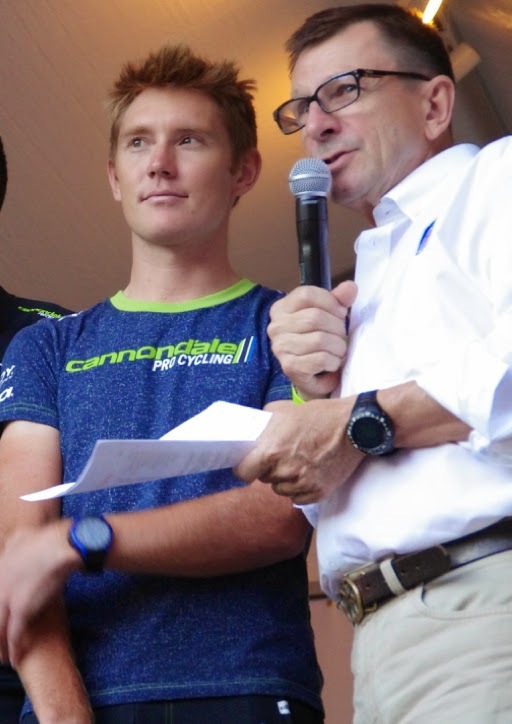 Race Announcer Brad Sohner (left) in Aspen standing by to interview Tejay van Garderen before Stage 2 start yesterday in Aspen. Read more about Brad in an interview I did years ago: Who is that voice on stage? Dave Towle interviewing Danny Summerhill yesterday, Dave has known Danny since he was a kid. Thursday: 6:00am roads inside Garden of the Gods closed to all cars. 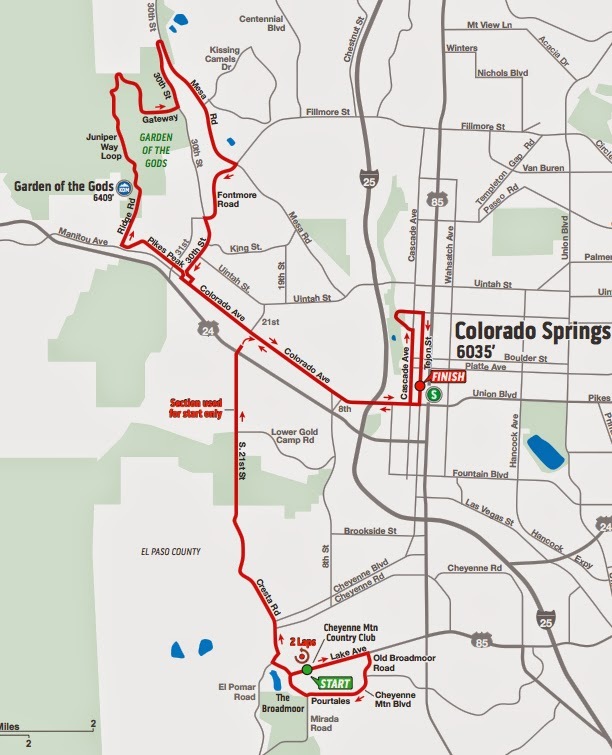 Best viewing: Start line at Broadmoor Hotel, Historic Area on Colorado Blvd, Garden of the Gods (uphill sections), downtown Colorado Springs sprint and finish line.